An anvil is a metalworking tool consisting of a large block of metal (usually forged or cast steel), with a flattened top surface, upon which another object is struck (or "worked"). Anvils are as massive as is practical, because the higher their inertia, the more efficiently they cause the energy of striking tools to be transferred to the work piece. In most cases the anvil is used as a forging tool. Before the advent of modern welding technology, it was a primary tool of metal workers. The great majority of modern anvils are made of cast or forged steel (the latter is stronger) that has been heat treated. Inexpensive anvils have been made of cast iron and low quality steel, but are considered unsuitable for serious use as they deform and lack rebound when struck. Because anvils are very ancient tools and were at one time very commonplace, they have acquired symbolic meaning beyond their use as utilitarian objects. They have even found their way into popular culture including episodes of Looney Tunes, the name of a heavy metal band, and usage by blacksmiths as well as jewelers and metal smiths. The primary work surface of the anvil is known as the face. It is generally made of hardened steel and should be flat and smooth with rounded edges for most work. Any marks on the face will be transferred to the work. Also, sharp edges tend to cut into the metal being worked and may cause cracks to form in the workpiece. The face is hardened and tempered to resist the blows of the smith's hammer, so the anvil face does not deform under repeated use. A hard anvil face also reduces the amount of force lost in each hammer blow. 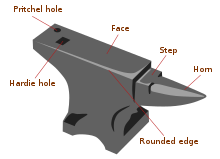 Hammers, tools, and work pieces of hardened steel should never directly strike the anvil face with full force, as they may damage it; this can result in chipping or deforming of the anvil face. The horn of the anvil is a conical projection used to form various round shapes and is generally unhardened steel or iron. The horn is used mostly in bending operations. It also is used by some smiths as an aid in "drawing down" stock (making it longer and thinner). Some anvils, mainly European, are made with two horns, one square and one round. Also, some anvils are made with side horns or clips for specialized work. The step is that area of the anvil between the "horn" and the "face". It is soft and is used for cutting; its purpose is to prevent damaging the steel face of the anvil by conducting such operations there and so as not to damage the cutting edge of the chisel, though many smiths shun this practice as it will damage the anvil over time. The hardie hole is a square hole into which specialized forming and cutting tools, called Hardy tools, are placed. It is also used in punching and bending operations. An anvil needs to be placed upon a sturdy base made from an impact and fire resistant material. It requires being fastened firmly to the base, so it will not move when struck with a hammer. A loose anvil is extremely unsafe, as it can fall off the base and is an ineffective forging tool. Common methods of attaching an anvil are spikes, chains, steel or iron straps, clips, bolts where there are holes provided, and cables. A smith would use whatever was at hand, as long as it held the anvil firmly in place. The anvil is placed as near to the forge as is convenient, generally no more than one step from the forge to prevent heat loss in the work piece. The most common base traditionally was a hard wood log or large timber buried several feet into the floor of the forge shop floor. This was done to make the anvil immobile when heavy forging and bending were done upon the anvil. In the industrial era cast iron bases became available. They had the advantage of adding additional weight to the anvil, making it more stable while making the anvil movable. These bases are highly sought after by collectors today. When concrete became widely available, there was a trend to make steel reinforced anvil bases by some smiths, though this practice has largely been abandoned. In more modern times many anvils have been placed upon bases fabricated from steel, often a short thick section of a large I-Beam. In addition, bases have been made from dimensional lumber bolted together to form a large block or steel drums full of oil-saturated sand to provide a damping effect. In recent times tripod bases of fabricated steel have become popular with some smiths. There are many designs for anvils, which are often tailored for a specific purpose or to meet the needs of a particular smith. For example, there were anvils specifically made for farriers, general smiths, cutlers, chain makers, armorers, saw tuners, coach makers, coopers, and many other types of metal workers. Such designs have originated in diverse geographic locations. The common blacksmith's anvil is made of either forged or cast steel, forged wrought iron with a hard steel face or cast iron with a hard steel face. Cast iron anvils are not used for forging as they are incapable of standing up to the impact and will crack and dent. Also, cast iron anvils without a hard steel face do not have the rebound that a harder anvil would and will tire out the smith. Historically, some anvils have been made with a smooth top working face of hardened steel welded to a cast iron or wrought iron body, though this manufacturing method is no longer in use. At one end, the common smith's anvil has a projecting conical bick (beak, horn) used for hammering curved work pieces. The other end is typically called the heel. Occasionally, the other end is also provided with a bick, partly rectangular in section. Most anvils made since the late 18th century also have a hardy hole and a pritchel hole where various tools, such as the anvil-cutter or hot chisel, can be inserted and held by the anvil. Some anvils have several hardy and pritchel holes, to accommodate a wider variety of hardy tools and pritchels. An anvil may also have a softer pad for chisel work. An anvil may have a marking indicating its weight, manufacturer, or place of origin. American-made anvils were often marked in pounds. European anvils are sometimes marked in kilograms. English anvils were often marked in hundredweight, the marking consisting of three numbers, indicating hundredweight, quarter hundredweight and pounds. For example, a 3-1-5, if such an anvil existed, would be 3×112 lb + 1×28 lb + 5 lb = 369 lb ≈ 168 kg. Cheap anvils made from inferior steel or cast iron and often sold at retail hardware stores, are considered unsuitable for serious use, and are often derisively referred to as "ASOs", or "anvil shaped objects". Amateur smiths have used lengths of railroad rail, forklift tines, or even simple blocks of steel as makeshift anvils. A metalworking vise may have a small anvil integrated into its design. Anvils were first made of stone as a lithic stone tool, then bronze, and later wrought iron. As steel became more readily available, anvils were faced with it. This was done to give the anvil a hard face and to stop the anvil from deforming from impact. Many regional styles of anvils evolved through time from the simple block that was first used by smiths. The majority of anvils found today in the US are based on the London pattern anvil of the mid-19th century. The wrought iron steel faced anvil was produced up until the early 20th century. Through the 19th and very early 20th centuries, this method of construction evolved to produce extremely high quality anvils. The basic process involved forge-welding billets of wrought iron together to produce the desired shape. The sequence and location of the forge-welds varied between different anvil makers and the kind of anvil being made. At the same time cast iron anvils with steel faces were being made in the United States. At the dawn of the 20th century solid cast steel anvils began to be produced, as well as two piece forged anvils made from closed die forgings. Modern anvils are generally made entirely from steel. There are many references to anvils in ancient Greek and Egyptian writings, including Homer's works. They have been found at the Calico Early Man Site in North America. Anvils have since lost their former commonness, along with the smiths who used them. Mechanized production has made cheap and abundant manufactured goods readily available. The one-off handmade products of the blacksmith are less economically viable in the modern world, while in the past they were an absolute necessity. However, anvils are still used by blacksmiths and metal workers of all kinds in producing custom work. They are also essential to the work done by farriers. Shape of a modern anvil. Application of the principles of the anvil predate historical human practice, there being a fair number of examples among various species of animals. Some of the most thoroughly documented ethological examples of tool use by animals in the wild were of chimpanzees observed using hammers of wood or stone to crack nuts, with logs or rocks serving as anvils. Less formally, birds such as some species of thrush have been known for centuries to crack the shells of the snails they feed on, by striking them on rocks. Other species of birds have similar habits, notably some of the tropical pittas, and individual birds of many such species have their own particular anvils where their discarded shell middens accumulate. Anvils being by some definitions "‘proto’ or ‘borderline’ tools..., ... not directly manipulated and not detached from the substrate", some workers argue that their use is less demanding of brain power than more sophisticated tools, and they accordingly are likely to be used by organisms of a wider range of organisation of the central nervous system than say, probes, hammers, hooks and scoops. The latter would be limited to species with correspondingly advanced mental powers. Certainly anvil use occurs very widely in nature, ranging from fishes that break open the shells of molluscs much as thrushes do, to sea otters that bring stones to the surface and drift on their backs, holding the stones on their chests as anvils on which they break open clams and similar hard-shelled prey. Gulls of various species, some crows, and large birds of prey smash open hard food items, such as bones and tortoises, by dropping them onto rocks. Anvil firing is the practice of firing an anvil into the air using gunpowder. It has been popular in California, the eastern United States and the southern United States, much like how fireworks are used today. There is a growing interest in re-enacting this "ancient tradition" in the US, which has now spread to England. The African Methodist Episcopal Church (AME) has the anvil in its coat of arms. The AME's first services were held in a blacksmith's shop. A typical metalworker's anvil, with horn at one end and flat face at the other, is a standard prop for cartoon gags, as the epitome of a heavy and clumsy object that is perfect for dropping onto a villain. This visual metaphor is common, for example, in Warner Brothers' Looney Tunes and Merrie Melodies shorts, such as those with Wile E. Coyote and The Road Runner. Anvils in cartoons were also referenced in an episode of Gilmore Girls, where one of the main characters tries to have a conversation about "Where did all the anvils go? ", a reference to their falling out of use on a general scale. Animaniacs made frequent gags on the topic throughout its run, even having a kingdom named Anvilania, whose sole national product is anvils. The Beatles: "Maxwell's Silver Hammer" makes prominent use of the anvil. Ringo Starr played the anvil. Howard Shore: The Lord of the Rings film trilogy. Used predominantly for the theme of Isengard. Josef Strauss: Feuerfest!, op. 269 (1869). The title means "fireproof". This was the slogan of the Wertheim fireproof safe company, which commissioned the work. Wagner's Ring des Nibelungen is notable in using the anvil as pitched percussion. The vast majority of extant works use the anvil as unpitched. However tuned anvils are available as musical instruments, albeit unusual. These are not to be confused with the "sawyers' anvils" used to "tune" big circular saw blades. Steel anvils are used for tuning for use as musical instruments, because those based partly on cast iron and similar materials give a duller sound; this is actually valued in industry, as pure steel anvils are troublesomely noisy, though energetically more efficient. The hammer and anvil have enjoyed varying popularity in orchestral roles. Robert Donington pointed out that Sebastian Virdung notes them in his book of 1510, and Martin Agricola includes it in his list of instruments (Musica instrumentalis deudsch, 1529) largely as a compliment to Pythagoras. In pre-modern or modern times anvils occasionally appear in operatic works by Berlioz, Bizet, Gounod, Verdi, and Wagner for example. Commonly pairs of anvils tuned a third apart are used. In practice modern orchestras commonly substitute a steel bar or other suitable steel structure that is easier to tune than an actual anvil, although a visibly convincing anvil-shaped prop may be shown as desired. In Das Rheingold Wagner scored for nine little, six mid-sized, and three large anvils, but orchestras seldom can afford instrumentation on such a scale. ^ "Ebay Fraud: Purchasing an ASO (Anvil Shaped Object)". Anvilfire.com. ^ "St Clements Day Celebrations". Archived from the original on 2009-11-19. ^ Maly, Tim (18 December 2012). "Elaborate Poster Puts All of Wile E. Coyote's ACME Purchases on Your Wall". Wired. Retrieved 25 April 2014. ^ Scott, Derek B. (2008). Sounds of the metropolis: the nineteenth-century popular music revolution in London, New York, Paris, and Vienna, p. 139. Oxford University Press, New York. ISBN 978-0-19-530946-1. ^ Donington, Robert (1970). Music and its Instruments. University Paperbacks Third edition. ISBN 9780416722802. Andrews, Jack (1994). New Edge of the Anvil. ISBN 978-1-879535-09-1. Hrisoulas, Jim (1987). The Complete Bladesmith: Forging Your Way to Perfection. Boulder, Colorado: Paladin Press. ISBN 978-0-87364-430-3. Postman, Richard (1998). Anvils In America. ISBN 978-0-9663256-0-7. Look up anvil in Wiktionary, the free dictionary. Chisholm, Hugh, ed. (1911). "Anvil" . Encyclopædia Britannica (11th ed.). Cambridge University Press.